Ancient Egypt was an ancient civilization of Northeastern Africa, concentrated along the lower reaches of the Nile River in what is now the modern country of Egypt. Egyptian civilization coalesced around 3150 BC (according to conventional Egyptian chronology) with the political unification of Upper and Lower Egypt under the first pharaoh. The history of ancient Egypt occurred in a series of stable Kingdoms, separated by periods of relative instability known as Intermediate Periods: the Old Kingdom of the Early Bronze Age, the Middle Kingdom of the Middle Bronze Age and the New Kingdom of the Late Bronze Age. 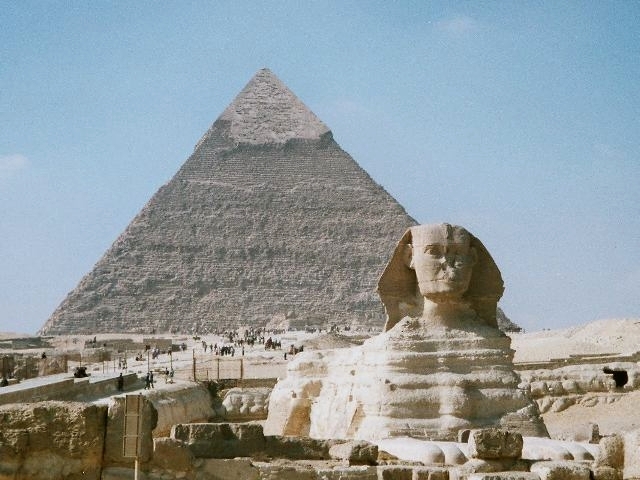 The Great Sphinx and the pyramids of Giza are among the most recognizable symbols of the civilization of ancient Egypt. Egypt reached the pinnacle of its power during the New Kingdom, in the Ramesside period where it rivalled the Hittite Empire, Assyrian Empire and Mitanni Empire, after which it entered a period of slow decline. Egypt was invaded or conquered by a succession of foreign powers (such as the Canaanites/Hyksos, Libyans, Nubians, Assyria, Babylonia, Persian rule and Macedonian Greece) in the Third Intermediate Period of Egypt and Late Period. In the aftermath of Alexander the Great's death, one of his generals, Ptolemy Soter, established himself as the new ruler of Egypt. This Greek Ptolemaic Dynasty ruled Egypt until 30 BC, when, under Cleopatra, it fell to the Roman Empire and became a Roman province. The success of ancient Egyptian civilization came partly from its ability to adapt to the conditions of the Nile River Valley. The predictable flooding and controlled irrigation of the fertile valley produced surplus crops, which fueled social development and culture. With resources to spare, the administration sponsored mineral exploitation of the valley and surrounding desert regions, the early development of an independent writing system, the organization of collective construction and agricultural projects, trade with surrounding regions, and a military intended to defeat foreign enemies and assert Egyptian dominance. Motivating and organizing these activities was a bureaucracy of elite scribes, religious leaders, and administrators under the control of a Pharaoh who ensured the cooperation and unity of the Egyptian people in the context of an elaborate system of religious beliefs. 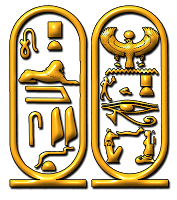 The many achievements of the ancient Egyptians include the quarrying, surveying and construction techniques that facilitated the building of monumental pyramids, temples, and obelisks; a system of mathematics, a practical and effective system of medicine, irrigation systems and agricultural production techniques, the first known ships, Egyptian faience and glass technology, new forms of literature, and the earliest known peace treaty with Hittites. Egypt left a lasting legacy. Its art and architecture were widely copied, and ist antiquities carried off to far corners of the world. Its monumental ruins have inspired the imaginations of travelers and writers for centuries. A new-found respect for antiquities and excavations in the early modern period led to the scientific investigation of Egyptian civilization and a greater appreciation of its cultural legacy. The Nile has been the lifeline of its region for much of human history. The fertile floodplain of the Nile gave humans the opportunity to develop a settled agricultural economy and a more sophisticated, centralized society that became a cornerstone in the history of human civilization. Nomadic modern human hunter-gatherers began living in the Nile valley through the end of the Middle Pleistocene some 120 thousand years ago. By the late Paleolithic period, the arid climate of Northern Africa became increasingly hot and dry, forcing the populations of the area to concentrate along the Region. prolific in all environs and the Nile region supported large populations of waterfowl. Hunting would have been common for Egyptians, and this is also the period when many animals were first domesticated. By about 5500 BC, small tribes living in the Nile valley had developed into a series of cultures demonstrating firm control of agriculture and animal husbandry, and identifiable by their pottery and personal items, such as combs, bracelets, and beads. The largest of these early cultures in upper (Southern) Egypt, the Badari which probably originated in the Western Desert, was known for its high quality ceramics, stone tools, and its use of copper. control of the people and resources of the Nile valley. Establishing a power center at Hierakonpolis, and later at Abydos, Naqada III leaders expanded their control of Egypt northwards along the Nile. They also traded with Nubia to the south, the oases of the western desert to the west, and the cultures of the eastern Mediterranean and Near East to the east. 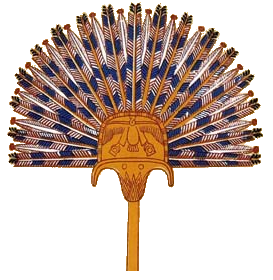 Royal Nubian burials at Qustul produced artifacts bearing the oldest known examples of Egyptian dynastic symbols, such as the white crown of Egypt and falcon. The Naqada culture manufactured a diverse selection of material goods, reflective of the increasing power and wealth of the elite, as well as societal personal-use items, which included combs, small statuary, painted pottery, high Quality decorative stone vases, cosmetic palettes, and jewelry made of gold, lapis, and ivory. They also developed a ceramic glaze known as faience, which was used well into the Roman Period to decorate cups, amulets, and figurines. During the last predynastic phase, the Naqada culture began using written symbols that eventually evolved into a full system of hieroglyphs for writing the ancient Egyptian language. The Early Dynastic Period was approximately contemporary to the early Sumerian-Akkadian civilisation of Mesopotamia and of ancient Elam. The 3rd-century BC Egyptian priest Manetho grouped the long line of pharaohs from Menes to his own time into 30 dynasties, a system still used today. 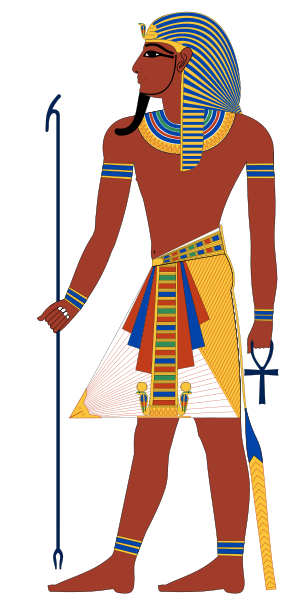 He chose to begin his official history with the king named "Meni" (or Menes in Greek) who was then believed to have united the two kingdoms of Upper and Lower Egypt (around 3100 BC). The transition to a unified state actually happened more gradually than ancient Egyptian writers would have us believe, and there is no contemporary record of Menes. 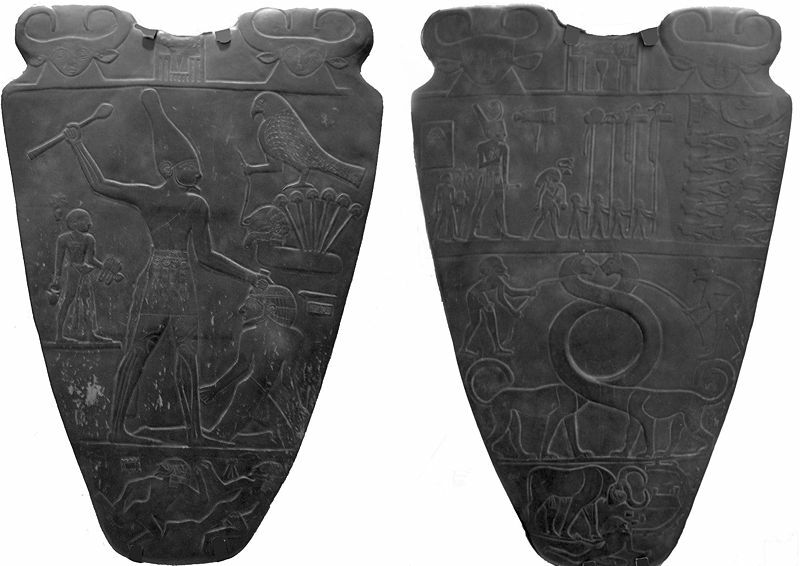 Some scholars now believe, however, that the mythical Menes may have actually been the pharaoh Narmer, who is depicted wearing royal regalia on the ceremonial Narmer Palette in a symbolic act of unification. In the Early Dynastic Period about 3150 BC, the first of the Dynastic pharaohs solidified their control over lower Egypt by establishing a capital at Memphis, from which they could control the labour force and agriculture of the fertile delta Region as well as the lucrative and critical trade routes to the Levant. The increasing power and wealth of the pharaohs during the early dynastic period was reflected in their elaborate mastaba tombs and mortuary cult structures at Abydos, which were used to celebrate the deified pharaoh after his death. The strong institution of kingship developed by the pharaohs served to legitimize state control over the land, labour, and resources that were essential to the survival and growth of ancient Egyptian civilization. Palette depicts the unification of the Two Lands. Major advances in architecture, art, and technology were made during the Old Kingdom, fueled by the increased agricultural productivity made possible by a well-developed central administration. Some of ancient Egypt's crowning achievements, the Giza pyramids and Great Sphinx, were constructed during the Old Kingdom. Under the direction of the vizier, state officials collected taxes, coordinated irrigation projects to improve crop yield, drafted peasants to work on construction projects, and established a justice system to maintain peace and order. Along with the rising importance of a central administration arose a new class of educated scribes and officials who were granted estates by the pharaoh in payment for their services. Pharaohs also made land grants to their mortuary cults and local temples to ensure that these institutions had the resources to worship the pharaoh after his death. It is believed that five centuries of These practices slowly eroded the economic power of the pharaoh, and that the economy could no longer afford to support a large centralized administration. As the power of the pharaoh diminished, regional governors called nomarchs began to challenge the supremacy of the pharaoh. This, coupled with severe droughts between 2200 and 2150 BC, is assumed to have caused the country to enter the 140-year period of famine and strife known as the First Intermediate Period. The pharaohs of the Middle Kingdom restored the country's prosperity and stability, thereby stimulating a resurgence of art, literature, and monumental building projects. Mentuhotep II and his 11th Dynasty successors ruled from Thebes, but the vizier Amenemhat I, upon assuming kingship at the beginning of the 12th Dynasty around 1985 BC, shifted the nation's capital to the city of Itjtawy located in Faiyum. From Itjtawy, the pharaohs of the 12th Dynasty undertook a far-sighted land reclamation and irrigation scheme to increase agricultural output in the region. Moreover, the military reconquered territory in Nubia rich in quarries and gold mines, while laborers built a defensive structure in the Eastern Delta, called the "Walls-of-the-Ruler", to defend against foreign attack. Having secured military and political security and vast agricultural and Mineral wealth, the nation's population, arts, and religion flourished. In contrast to elitist Old Kingdom attitudes towards the gods, the Middle Kingdom experienced an increase in expressions of personal piety and what could be called a democratization of the afterlife, in which all people possessed a soul and could be welcomed into the company of the gods after death. Middle Kingdom literature featured sophisticated themes and characters written in a confident, eloquent style, and the relief and portrait sculpture of the period captured subtle, individual details that reached new heights of technical perfection. The last great ruler of the Middle Kingdom, Amenemhat III, allowed Semitic speaking Canaanite settlers from the Near East into the delta region to provide a sufficient labour force for his especially active mining and building campaigns. These ambitious building and mining activities, however, combined with severe Nile floods later in his reign, strained the economy and precipitated the slow decline into the Second Intermediate Period during the later 13th and 14th dynasties. During this decline, the Canaanite settlers began to seize control of the delta region, eventually coming to power in Egypt as the Hyksos. 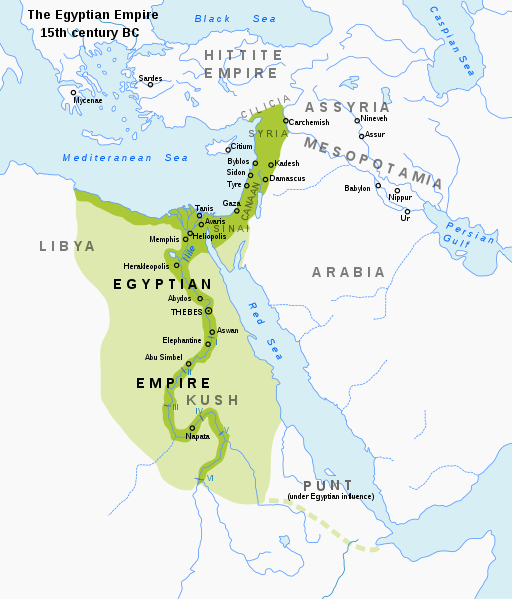 Around 1785 BC, as the power of the Middle Kingdom pharaohs weakened, a Semitic Canaanite people called the Hyksos had already settled in the Eastern Delta town of Avaris, seized control of Egypt, and forced the central government to retreat to Thebes, where the pharaoh was treated as a vassal and expected to pay tribute. The Hyksos ("foreign rulers") retained Egyptian models of government and portrayed themselves as pharaohs, thus integrating Egyptian elements into their culture. They and other Semitic invaders introduced new tools of warfare into Egypt, most notably the composite bow and the horse-drawn chariot. After their retreat, the native Theban kings found themselves trapped between the Canaanite Hyksos ruling the north and the Hyksos' Nubian allies, the Kushites, to the south of Egypt. After years of vassalage, Thebes gathered enough strength to challenge the Hyksos in a conflict that lasted more than 30 years, until 1555 BC. The pharaohs Seqenenre Tao II and Kamose were ultimately able to defeat the Nubians to the south of Egypt, but failed to defeat the Hyksos. That task fell to Kamose's successor, Ahmose I, who successfully waged a series of campaigns that permanently eradicated the Hyksos' presence in Egypt. He established a new dynasty. In the New Kingdom that followed, the military became a central priority for the pharaohs seeking to expand Egypt's borders and attempting to gain mastery of the Near East. The New Kingdom pharaohs established a period of unprecedented prosperity by securing their borders and strengthening diplomatic ties with their neighbours, including the Mitanni Empire, Assyria, and Canaan. Military campaigns waged under Tuthmosis I and his grandson Tuthmosis III extended the influence of the pharaohs to the largest empire Egypt had ever seen. Between their reigns, Hatshepsut generally promoted peace and extended trade routes back to those lost during the Hyksos occupation, as well as venturing to new regions. When Tuthmosis III died in 1425 BC, Egypt had an empire extending from Niya in North West Syria to the fourth waterfall of the Nile in Nubia, cementing loyalties and opening access to critical imports such as bronze and wood. The New Kingdom pharaohs began a large-scale building campaign to promote the god Amun, whose growing cult was based in Karnak. They also constructed monuments to glorify their own achievements, both real and imagined. The pharaoh Hatshepsut used such hyperbole and grandeur during her reign of almost twenty-two years. 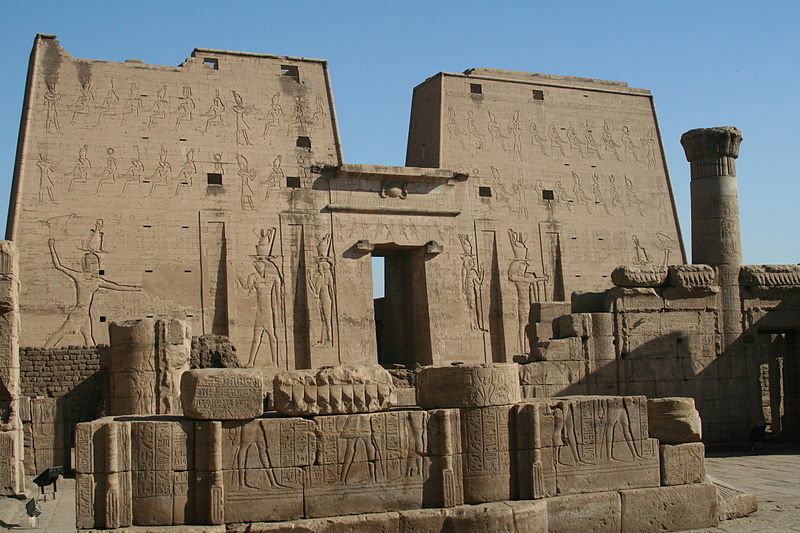 Her reign was very successful, marked by an extended period of peace and wealth-building, trading expeditions to Punt, restoration of foreign trade networks, great building projects including an elegant mortuary temple that rivaled the Greek architecture of a thousand years later, a colossal pair of obelisks, and a chapel at Karnak. 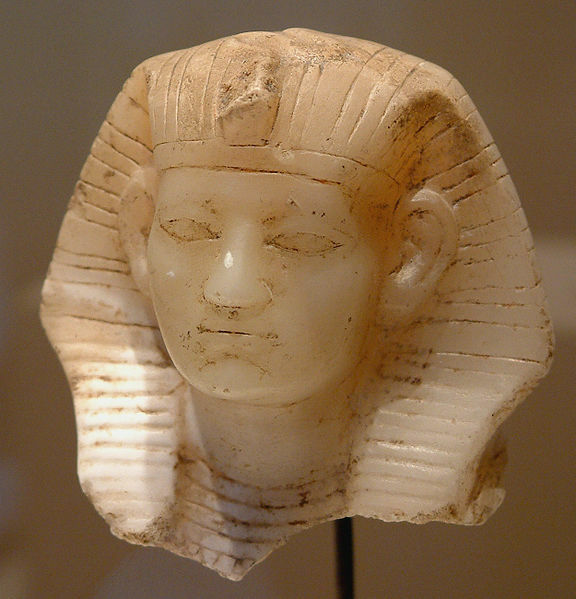 Despite her achievements, the heir to Hatshepsut's nephew-stepson Tuthmosis III, Amenhotep II, sought to erase her legacy near the end of his father's reign and throughout his, touting many of her accomplishments as his. 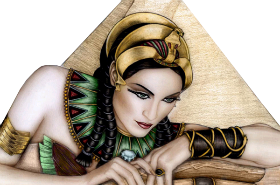 He also attempted to change many established traditions that had developed over the centuries, which some suggest was a futile attempt to prevent other women from becoming pharaoh and to curb their influence in the kingdom. the power of the temple that had become dominated by the priests of Amun in Thebes, whom he saw as corrupt. Moving the capital to the new city of Akhetaten (modern-day Amarna), Akhenaten turned a deaf ear to events in the Near East (where the Hittites, Mitanni, and Assyrians were vying for control) and absorbed himself in his new religion and artistic style. After his death, the cult of the Aten was quickly abandoned, the priests of Amun soon regained power and returned the capital to Thebes, and under their influence the subsequent pharaohs Tutankhamun, Ay, and Horemheb attempted to erase all mention of Akhenaten's heresy, now known as the Amarna Period. 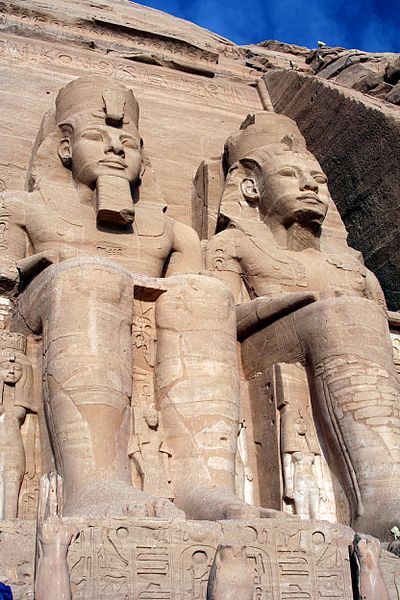 Around 1279 BC, Ramesses II, also known as Ramesses the Great, ascended the throne, and went on to build more temples, erect more statues and obelisks, and sire more children than any other pharaoh in history. A bold military leader, Ramesses II led his army against the Hittites in the Battle of Kadesh (in modern Syria) and, after fighting to a stalemate, finally agreed to the first recorded peace treaty, around 1258 BC. With both the Egyptians and Hittite Empire proving unable to gain the upper hand over one another, and both powers also fearful of the expanding Middle Assyrian Empire, Egypt withdraw from much of the Near East. The Hittites were thus left to compete unsuccessfully with the powerful Assyrians and the newly arrived Phrygians. Egypt's wealth, however, made it a tempting target for invasion, particularly by the Libyan Berbers to the west, and the Sea Peoples, a powerful confederation of largely Greek, Luwian and Phoenician/Caananite pirates from the Aegean. Initially, the military was able to repel these invasions, but Egypt eventually lost control of its remaining territories in southern Caanan, much of it falling to the Assyrians. The impact of external threats was exacerbated by internal Problems such as corruption, tomb robbery, and civil unrest. After regaining their power, the high priests at the temple of Amun in Thebes accumulated vast tracts of land and wealth and their expanded power splintered the country during the Third Intermediate Period. delta under Shoshenq I in 945 BC, founding the so-called Libyan Berber, or Bubastite, dynasty that ruled for some 200 years. Shoshenq also gained control of southern Egypt by placing his family members in important priestly positions. In the mid-9th century BC, Egypt made a failed attempt to once more gain a foothold in Western Asia. Osorkon II of Egypt, along with a large alliance of nations and peoples, including; Israel, Hamath, Phoenicia/Caanan, the Arabs, Arameans, and neo Hittites among others engaged in the Battle of Karkar against the powerful Assyrian king Shalmaneser III in 853 BC, however this coalition of powers failed, and the Assyrian Empire continued to dominate the Region. Libyan Berber control began to erode as a rival native dynasty in the delta arose in Leontopolis. Also, the Nubians of the Kushites threatened Egypt from the lands to the south. Drawing on millennia of interaction (trade, acculturation, occupation, assimilation, and war with Egypt, the Kushite king Piye left his Nubian capital of Napata and invaded Egypt around 727 BC. 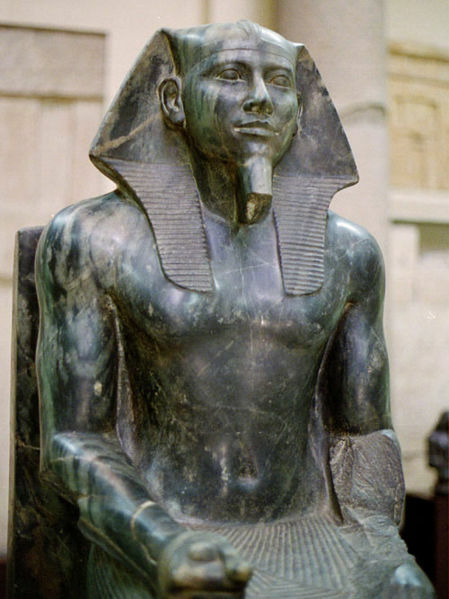 Piye easily seized control of Thebes and eventually the Nile Delta. He recorded the episode on his stela of victory. Piye set the stage for subsequent 25th dynasty pharaohs, such as Taharqa, to reunite the "Two lands" of Northern and Southern Egypt. The Nile valley empire was as large as it had been since the New Kingdom. The 25th dynasty ushered in a renaissance period for ancient Egypt. Religion, the arts, and architecture were restored to their glorious Old, Middle, and New Kingdom forms. Pharaohs, such as Taharqa, built or restored temples and monuments throughout the Nile valley, including at Memphis, Karnak, Kawa, Jebel Barkal, etc. 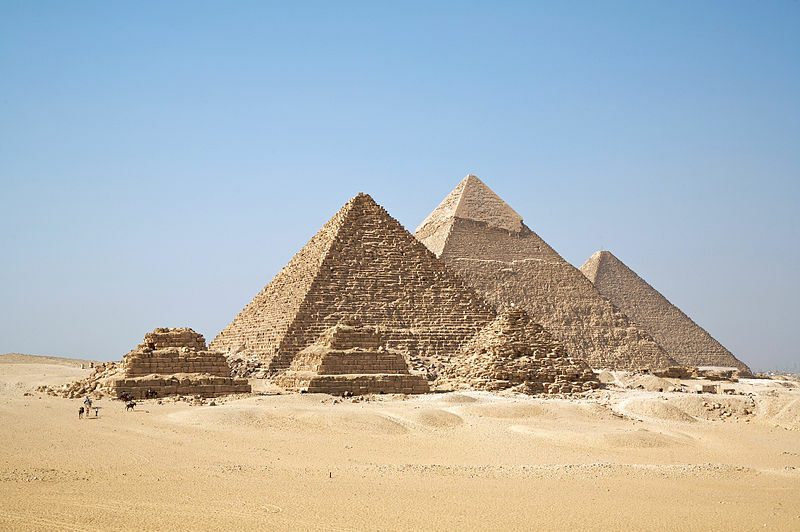 It was during the 25th dynasty that the Nile valley saw the first widespread construction of pyramids (many in modern Sudan) since the Middle Kingdom. Piye made various unsuccessful attempts to extend Egyptian influence in the Near East, then controlled by Assyria. In 720 BC he sent an army in support a Rebellion against Assyria in Philistia and Gaza, however Piye was defeated by Sargon II, and the rebellion failed. In 711 BC Piye again supported a revolt against the Assyrians by the Israelites of Ashdod, and was once again defeated by the Assyrian king Sargon II, and Piye was forced from the Near East. the two Empires became inevitable. Taharqa enjoyed some initial minor success in his attempts to regain a foothold in the Near East. He aided the Judean King Hezekiah when the latter was attacked by Sennacherib, the Assyrian king, who was besieging Jerusalem (2 Kings 19:9;Isaiah 37:9), however disease among the besiegers appears to have been the primary reason for failing to actually take the city, and Senacherib's annals claim Judah was forced into Tribute regardless. Eventually however, the Assyrian King Sennacherib defeated Taharqa and drove the Egyptians and Nubians from the Near East. The Assyrians, tiring of Egyptian meddling in its empire, began their invasion of Egypt under King Esarhaddon, successor of Sennacherib, who had been murdered by his own sons for destroying the rebellious city of Babylon. Taharqa was easily routed, and driven from power by Esarhaddon who conquered Egypt with surprising speed, thus destroying the Kushite Empire in the process. 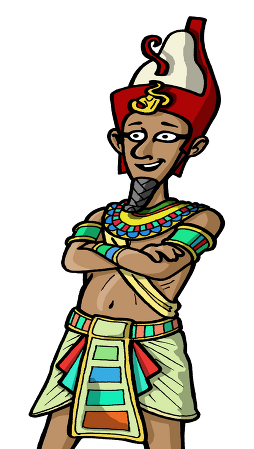 Defeated, Taharqa fled back to his Nubian homeland. Esarhaddon describes; "installing local kings and governors" and "All Ethiopians (Nubians/Kushites) I deported from Egypt,leaving not one to do homage to me". However, the native rulers installed by Esarhaddon were unable to retain full control of the whole country for long. Two years later, Taharqa returned from Nubia and seized control of a section of southern Egypt as far north as Memphis. Esarhaddon prepared to return to Egypt and once more eject Taharqa, however he fell ill and died in his capital Nineveh before he left Assyria. His successor, Ashurbanipal, sent a general with a small but well trained army which defeated and ejected Taharqa from Memphis, and once more drove him from Egypt. Taharqa died in Nubia two years later. His successor, Tanutamun, also made a failed attempt to regain Egypt for Nubia. He successfully defeated Necho, the puppet ruler installed by Ashurbanipal, taking Thebes in the process. The Assyrians then sent a large army southwards. Tantamani (Tanutamun) was heavily routed and fled back to Nubia. The Assyrian army sacked Thebes to such an extent it never truly recovered. A native ruler, Psammetichus I was placed on the throne, as a vassal of Ashurbanipal, and the Nubians were never again to pose a threat. in an attempt to save Assyria, which after a brutal internal civil war was being ovverrun by this coalition of powers. However, the attempt to save Egypts former masters failed. The Egyptians delayed intervening too long, and Nineveh had already fallen and King Sin-shar-ishkun was dead by the time Necho II sent his armies northwards. However Necho easily brushed aside the Israelite army under King Josiah but he and the Assyrians then lost a battle at Harran to the Babylonians, Medes and Scythians. Necho II and Ashur-uballit II of Assyria were finally defeated at Carchemish in Aramea (modern Syria) in 605 BC. The Egyptians remained in the area for some dacades, struggling with the Babylonian kings Nabopolassar and Nebuchadnezzar II for control of portions of the former Assyrian Empire in The Levant. However, they were eventually driven back into Egypt, and Nebuchadnezzar II even briefly invaded Egypt itself in 567 BC. The Saite kings based in the new capital of Sais witnessed a brief but spirited resurgence in the economy and culture, but in 525 BC, the powerful Persians, led by Cambyses II, began their conquest of Egypt, eventually capturing the pharaoh Psamtik III at the battle of Pelusium. Cambyses II then assumed the formal title of pharaoh, but ruled Egypt from his home of Susa in Persia (modern Iran), leaving Egypt under the control of a satrapy. A few temporarily successful revolts against the Persians marked the 5th century BC, but Egypt was never able to permanently overthrow the Persians. Following its annexation by Persia, Egypt was joined with Cyprus and Phoenicia (modern Lebanon) in the sixth satrapy of the Achaemenid Persian Empire. This first period of Persian rule over Egypt, also known as the Twenty-Seventh dynasty, ended in 402 BC, and from 380–343 BC the Thirtieth Dynasty ruled as the last native royal house of dynastic Egypt, which ended with the kingship of Nectanebo II. A brief restoration of Persian rule, sometimes known as the Thirty-First Dynasty, began in 343 BC, but shortly after, in 332 BC, the Persian ruler Mazaces handed Egypt over to the Macedonian ruler Alexander the Great without a fight. In 332 BC, Alexander the Great conquered Egypt with little resistance from the Persians and was welcomed by the Egyptians as a deliverer. The Administration established by Alexander's successors, the Macedonian Ptolemaic dynasty, was based on an Egyptian model and based in the new capital city of Alexandria. The city showcased the power and prestige of Hellenistic rule, and became a seat of learning and culture, centered at the famous Library of Alexandria. The Lighthouse of Alexandria lit the way for the many ships that kept trade flowing through the city—as the Ptolemies made commerce and revenue-generating enterprises, such as papyrus manufacturing, their top priority. Hellenistic culture did not supplant native Egyptian culture, as the Ptolemies supported time-honored traditions in an effort to secure the loyalty of the populace. They built new temples in Egyptian style, supported traditional cults, and portrayed themselves as pharaohs. 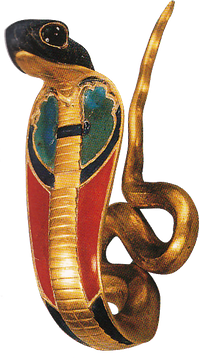 Some traditions merged, as Greek and Egyptian gods were syncretized into composite deities, such as Serapis, and classical Greek forms of sculpture influenced traditional Egyptian motifs. Despite their efforts to appease the Egyptians, the Ptolemies were challenged by native rebellion, bitter family rivalries, and the powerful mob of Alexandria that formed after the death of Ptolemy IV. In addition, as Rome relied more heavily on imports of grain from Egypt, the Romans took great interest in the political situation in the country. Continued Egyptian revolts, ambitious politicians, and powerful Syriac opponents from the Near East made this situation unstable, leading Rome to send forces to secure the country as a province of its empire. the meeting of Egyptian and Roman cultures. Egypt became a province of the Roman Empire in 30 BC, following the defeat of Marc Antony and Ptolemaic Queen Cleopatra VII by Octavian (later Emperor Augustus) in the Battle of Actium. The Romans relied heavily on grain shipments from Egypt, and the Roman army, under the control of a prefect appointed by the Emperor, quelled rebellions, strictly enforced the collection of heavy taxes, and prevented attacks by bandits, which had become a notorious problem during the period. Alexandria became an increasingly important center on the trade route with the orient, as exotic luxuries were in high demand in Rome. Although the Romans had a more hostile attitude than the Greeks towards the Egyptians, some traditions such as mummification and worship of the traditional gods continued. The art of mummy portraiture flourished, and some of the Roman emperors had themselves depicted as pharaohs, though not to the extent that the Ptolemies had. The former lived outside Egypt and did not perform the ceremonial functions of Egyptian kingship. Local administration became Roman in style and closed to native Egyptians. From the mid-1st century, Christianity took root in Egypt as it was seen as another cult that could be accepted. However, it was an uncompromising religion that sought to win converts from Egyptian Religion and Greco-Roman religion and threatened the popular religious traditions. This led to persecution of converts to Christianity, culminating in the great purges of Diocletian starting in 303, but eventually Christianity won out. In 391 the Christian Emperor Theodosius introduced legislation that banned pagan rites and closed temples. Alexandria became the scene of great anti-pagan riots with public and private religious imagery destroyed. As a consequence, Egypt's native religious culture was continually in decline. While the native population certainly continued to speak their language, the ability to read hieroglyphic writing slowly disappeared as the role of the Egyptian temple priests and priestesses diminished. The temples themselves were sometimes converted to churches or abandoned to the desert. In the 4th century AD, the Roman Empire split into two, and Egypt became part of the Eastern Empire, known as the Byzantine Empire. The Eastern Empire became increasingly "oriental" and "Eastern" in style, as ist links with the old Greco-Roman world faded. The Greek system of local government by citizens had now entirely disappeared. The Sassanid Persians who were involved in a long running and draining war with Byzantium for control of the Near East, Asia Minor, North Africa and the east Mediterranean, briefly recaptured Egypt under King Khosrow II in 618 AD, but were ejected by the Byzantine Emperor Heraclius in 628 AD. An army of 4,000 Arabs led by Amr Ibn Al-Aas was sent by the Caliph Umar, successor to Muhammad, to spread Islamic rule to the west. 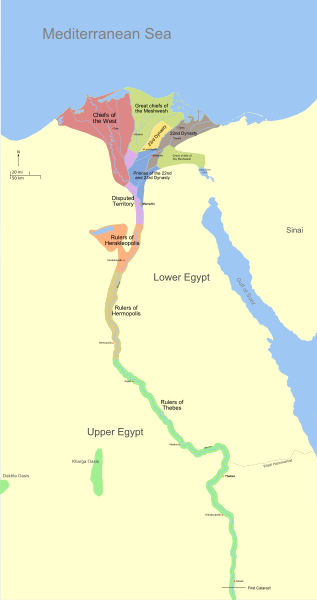 The Arabs crossed into Egypt from Palestine in December 639 AD, and advanced rapidly into the Nile Delta. The Imperial garrisons, exhausted by constant war with the Persians, retreated into the walled towns, where they successfully held out for a year or more. But the Arabs sent for reinforcements, and in April 641 they captured Alexandria. The Byzantines did assemble a fleet with the aim of recapturing Egypt, and won back Alexandria in 645, but the Muslims retook the city in 646, completing the Arab Muslim conquest of Egypt. Thus ended 975 years of Græco-Roman rule over Egypt. descendant of the Demotic Egyptian (which itself was an evolution of Ancient Egyptian) spoken in the Roman era. Since the 18th century, Coptic has mostly been limited to liturgical use and today Coptic is extinct as a Primary language. Copts still to this day espouse an Egyptian rather than Arab ethnic identity. was usually depicted wearing symbols of royalty and power. Much of the economy was centrally organized and strictly controlled. Although the ancient Egyptians did not use coinage until the late period, they did use a type of money-barter system, with standard sacks of grain and the Deben, a weight of roughly 91 grams (3 oz) of copper or silver, forming a common denominator. Workers were paid in grain; a simple laborer might earn 5½ sacks (200 kg or 400 lb) of grain per month, while a foreman might earn 7½ sacks (250 kg or 550 lb). Prices were fixed across the country and recorded in lists to facilitate trading; for example a shirt cost five copper deben, while a cow cost 140 deben. Grain could be traded for other goods, according to the fixed Price list. During the 5th century BC coined money was introduced into Egypt from abroad. At first the coins were used as standardized pieces of precious metal rather than true money, but in the following centuries international Traders came to rely on coinage. 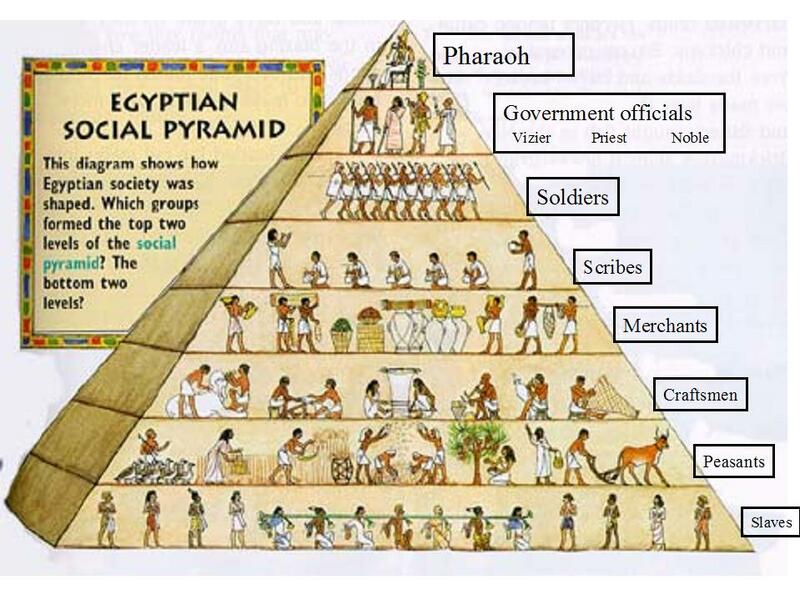 Egyptian society was highly stratified, and social status was expressly displayed. Farmers made up the bulk of the population, but agricultural produce was owned directly by the state, temple, or noble family that owned the land. Farmers were also subject to a labor tax and were required to work on irrigation or construction projects in a corvée system. Artists and craftsmen were of higher status than farmers, but they were also under state control, working in the shops attached to the temples and paid directly from the state Treasury. Scribes and officials formed the upper class in ancient Egypt, the so-called "white kilt class" in reference to the bleached linen garments that served as a mark of their rank. The upper class prominently displayed their social status in art and literature. Below the nobility were the priests, physicians, and engineers with specialized training in their field. 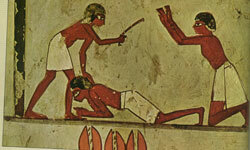 Slavery was known in ancient Egypt, but the extent and prevalence of its practice are unclear. 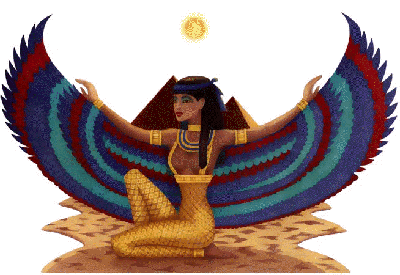 Cleopatra VI even became pharaohs, while others wielded power as Divine Wives of Amun. Despite these freedoms, ancient Egyptian women did not often take part in official roles in the administration, served only secondary roles in the temples, and were not as likely to be as educated as men. 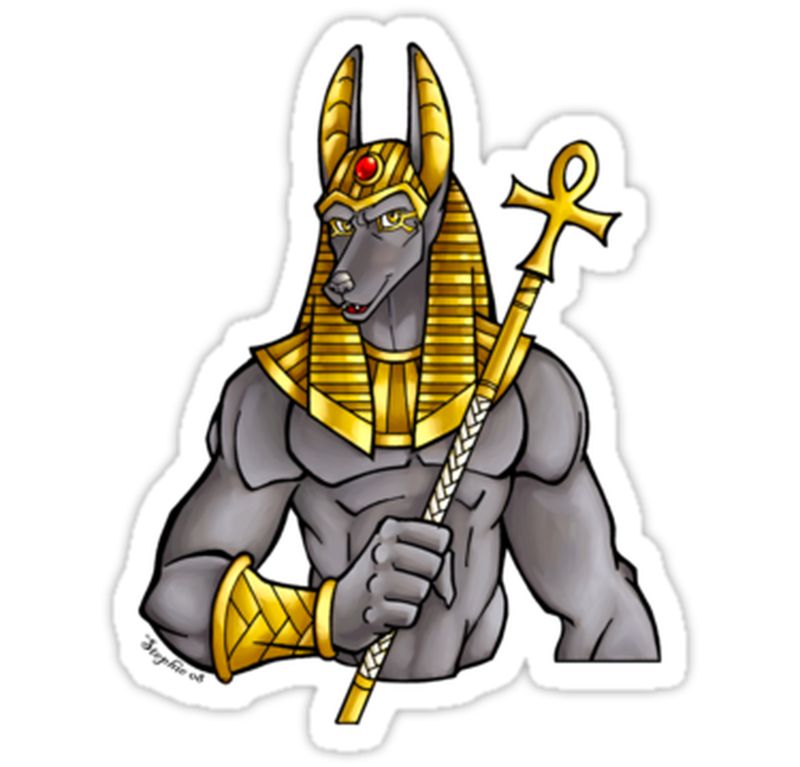 The head of the legal system was officially the pharaoh, who was responsible for enacting laws, delivering justice, and maintaining law and order, a concept the ancient Egyptians referred to as Ma'at. Although no legal codes from ancient Egypt survive, court documents show that Egyptian law was based on a common-sense view of right and wrong that emphasized reaching agreements and resolving conflicts rather than strictly adhering to a complicated set of statutes. Local councils of elders, known as Kenbet in the New Kingdom, were responsible for ruling in court cases involving small claims and minor disputes. More serious cases involving murder, major land transactions, and tomb robbery were referred to the Great Kenbet, over which the vizier or pharaoh presided. Plaintiffs and defendants were expected to represent themselves and were required to swear an oath that they had told the truth. In some cases, the state took on both the role of prosecutor and judge, and it could torture the accused with beatings to obtain a confession and the names of any co-conspirators. Whether the charges were trivial or serious, court scribes documented the complaint, testimony, and verdict of the case for future reference. 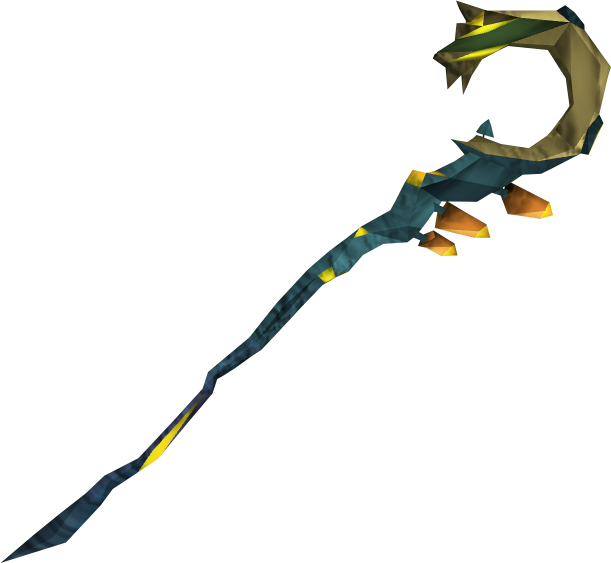 decapitation, drowning, or impaling the criminal on a stake. Punishment could also be extended to the criminal's family. Beginning in the New Kingdom, oracles played a major role in the legal system, dispensing justice in both civil and criminal cases. The procedure was to ask the god a "yes" or "no" question concerning the right or wrong of an issue. The god, carried by a number of priests, rendered judgment by choosing one or the other, moving forward or backward, or pointing to one of the answers written on a Piece of papyrus or an ostracon. A tomb relief depicts workers plowing the fields, harvesting the crops, and threshing the grain under the direction of an overseer, painting in the tomb of Nakht. A combination of favorable geographical features contributed to the success of ancient Egyptian culture, the most important of which was the rich fertile soil resulting from annual inundations of the Nile River. The ancient Egyptians were thus able to produce an abundance of food, allowing the population to devote more time and resources to cultural, technological, and artistic pursuits. Land management was crucial in ancient Egypt because taxes were assessed based on the amount of land a person owned. 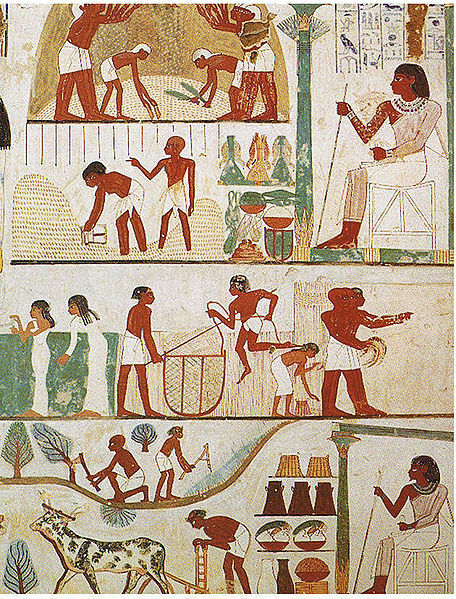 Farming in Egypt was dependent on the cycle of the Nile River. 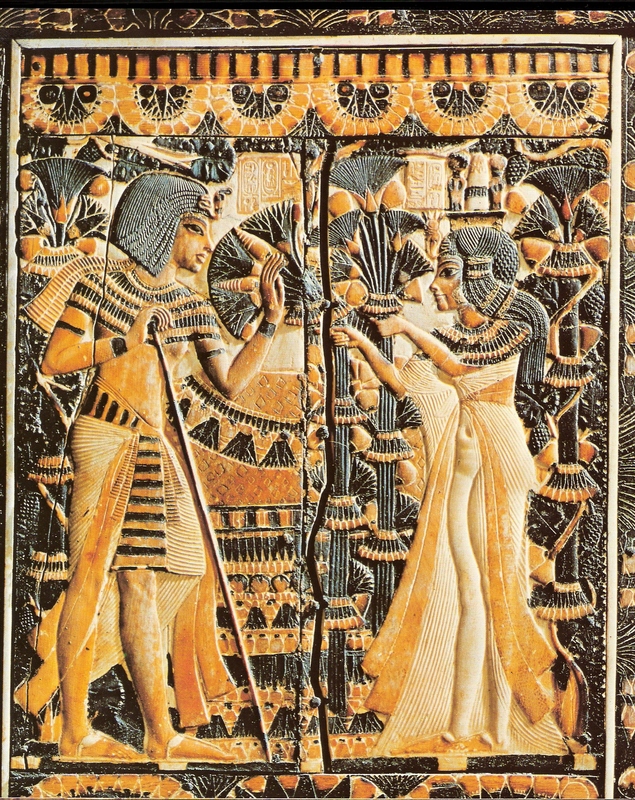 The Egyptians recognized three seasons: Akhet (flooding), Peret (planting), and Shemu (harvesting). The flooding season lasted from June to September, depositing on the river's Banks a layer of mineral-rich silt ideal for growing crops. After the floodwaters had receded, the growing season lasted from October to February. Farmers plowed and planted seeds in the fields, which were irrigated with ditches and canals. Egypt received little rainfall, so farmers relied on the Nile to water their crops. From March to May, farmers used sickles to harvest their crops, which were then threshed with a flail to separate the straw from the grain. Winnowing removed the chaff from the grain, and the grain was then ground into flour, brewed to make beer, or stored for later use. The ancient Egyptians cultivated emmer and barley, and several other cereal grains, all of which were used to make the two main food staples of bread and beer. Flax plants, uprooted before they started flowering, were grown for the fibers of their stems. These fibers were split along their length and spun into thread, which was used to weave sheets of linen and to make clothing. Papyrus growing on the banks of the Nile River was used to make paper. Vegetables and fruits were grown in garden plots, close to habitations and on higher ground, and had to be watered by hand. Vegetables included leeks, garlic, melons, squashes, pulses, lettuce, and other crops, in addition to grapes that were made into wine. Measuring and recording the harvest is shown in a wall painting in the tomb of Menna, at Thebes, Egypt (18th dynasty). The Egyptians believed that a balanced relationship between people and animals was an essential element of the cosmic order; thus humans, animals and plants were believed to be members of a single whole. Animals, both domesticated and wild, were therefore a critical source of spirituality, companionship, and sustenance to the ancient Egyptians. Cattle were the most important livestock; the administration collected taxes on livestock in regular censuses, and the size of a herd reflected the prestige and importance of the estate or temple that owned them. In addition to cattle, the ancient Egyptians kept sheep, goats, and pigs. Poultry such as ducks, geese, and pigeons were captured in nets and bred on farms, where they were force-fed with dough to fatten them. The Nile provided a plentiful source of fish. Bees were also domesticated from at least the Old Kingdom, and they provided both honey and wax. 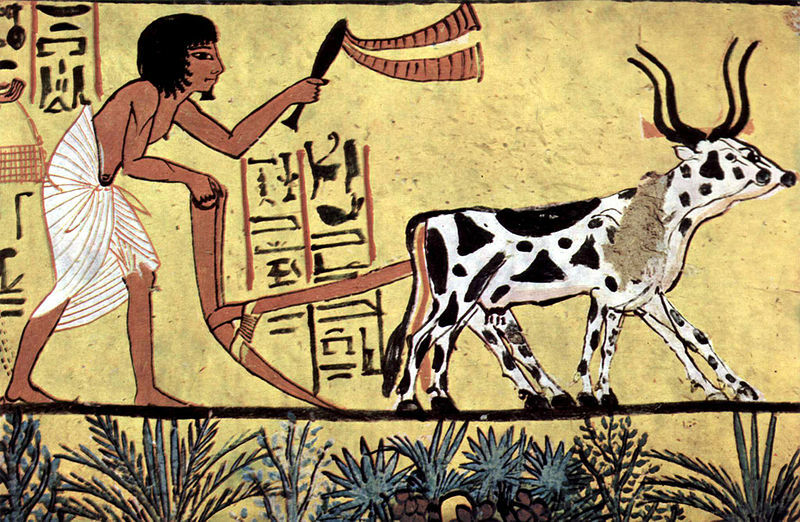 The ancient Egyptians used donkeys and oxen as beasts of burden, and they were responsible for plowing the fields and trampling seed into the soil. The slaughter of a fattened ox was also a central part of an offering ritual. Horses were introduced by the Hyksos in the Second Intermediate Period, and the camel, although known from the New Kingdom, was not used as a beast of burden until the Late Period. There is also evidence to suggest that elephants were briefly utilized in the Late Period, but largely abandoned due to lack of grazing land. Dogs, cats and monkeys were common family pets, while more exotic pets imported from the heart of Africa, such as lions, were reserved for royalty. Herodotus observed that the Egyptians were the only people to keep their animals with them in their houses. During the Predynastic and Late periods, the worship of the gods in their animal form was extremely popular, such as the cat goddess Bastet and the ibis god Thoth, and these animals were bred in large numbers on farms for the purpose of ritual sacrifice. used salts from the Wadi Natrun for mummification, which also provided the gypsum needed to make plaster. Ore-bearing rock formations were found in distant, inhospitable wadis in the eastern desert and the Sinai, requiring large, state-controlled expeditions to obtain natural resources found there. There were extensive gold mines in Nubia, and one of the first maps known is of a gold mine in this region. The Wadi Hammamat was a notable source of granite, greywacke, and gold. Flint was the first mineral collected and used to make tools, and flint handaxes are the earliest pieces of evidence of habitation in the Nile valley. Nodules of the mineral were carefully flaked to make blades and arrowheads of moderate hardness and durability even after copper was adopted for this purpose. Ancient Egyptians were among the first to use minerals such as sulfur as cosmetic substances. The Egyptians worked deposits of the lead ore galena at Gebel Rosas to make net sinkers, plumb bobs, and small figurines. Copper was the most important metal for toolmaking in ancient Egypt and was smelted in furnaces from malachite ore mined in the Sinai. Workers collected gold by washing the nuggets out of sediment in alluvial deposits, or by the more labor-intensive process of grinding and washing gold-bearing quartzite. 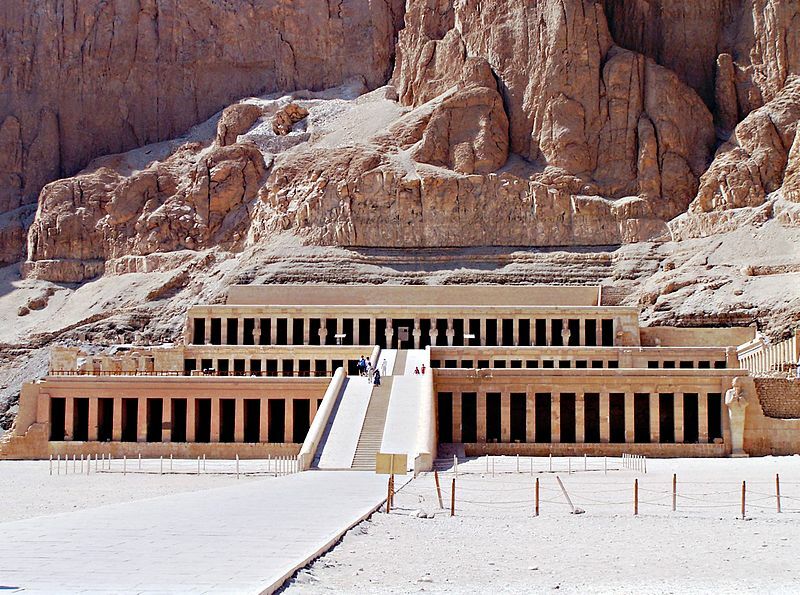 Iron deposits found in upper Egypt were utilized in the Late Period. High-quality building stones were abundant in Egypt; the ancient Egyptians quarried limestone all along the Nile valley, granite from Aswan, and basalt and sandstone from the wadis of the eastern desert. Deposits of decorative stones such as porphyry, greywacke, alabaster, and carnelian dotted the eastern desert and were collected even before the First Dynasty. In the Ptolemaic and Roman Periods, miners worked deposits of emeralds in Wadi Sikait and amethyst in Wadi el-Hudi. Miners worshipped Hathor, the "goddess of turquoise", who was believed to protect them. The ancient Egyptians engaged in trade with their foreign neighbors to obtain rare, exotic goods not found in Egypt. In the Predynastic Period, they established trade with Nubia to obtain gold and incense. They also established trade with Palestine, as evidenced by Palestinian-style oil jugs found in the burials of the First Dynasty pharaohs. An Egyptian colony stationed in southern Canaan Dates to slightly before the First Dynasty. 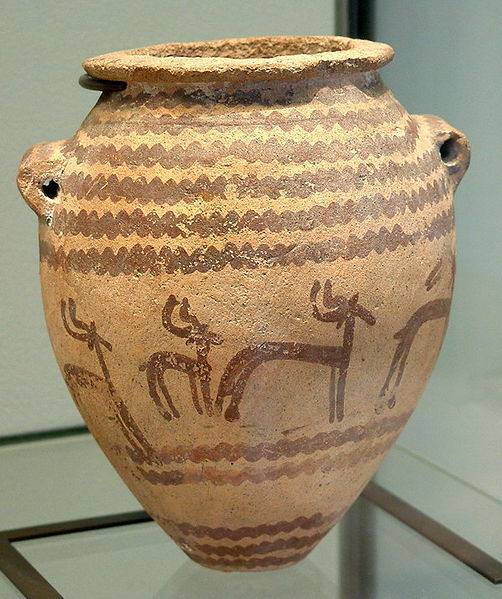 Narmer had Egyptian pottery produced in Canaan and exported back to Egypt. By the Second Dynasty at latest, ancient Egyptian trade with Byblos yielded a critical source of quality timber not found in Egypt. By the Fifth Dynasty, trade with Punt provided gold, aromatic resins, ebony, ivory, and wild animals such as monkeys and baboons. Egypt relied on trade with Anatolia for essential quantities of tin as well as supplementary supplies of copper, both metals being necessary for the manufacture of bronze. The ancient Egyptians prized the blue stone lapis lazuli, which had to be imported from far-away Afghanistan. Egypt's Mediterranean trade partners also included Greece and Crete, which provided, among other goods, supplies of olive oil. In exchange for its luxury imports and raw materials, Egypt mainly exported grain, gold, linen, and papyrus, in addition to other finished goods including glass and stone objects. The Egyptian language is a northern Afro-Asiatic language closely related to the Berber and Semitic languages. It has the second longest history of any language (after Sumerian), having been written from c. 3200 BC to the Middle Ages and remaining as a spoken language for longer. 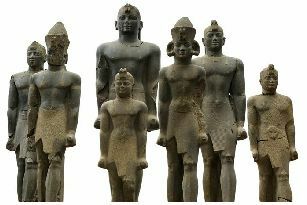 The phases of ancient Egyptian are Old Egyptian, Middle Egyptian (Classical Egyptian), Late Egyptian, Demotic and Coptic. Egyptian writings do not show dialect differences before Coptic, but it was probably spoken in regional dialects around Memphis and later Thebes. Ancient Egyptian was a synthetic language, but it became more analytic later on. Late Egyptian develops prefixal definite and indefinite articles, which replace the older inflectional suffixes. There is a change from the older verb–subject–object word order to subject–verb–object. The Egyptian hieroglyphic, hieratic, and demotic scripts were eventually replaced by the more phonetic Coptic alphabet. Coptic is still used in the liturgy of the Egyptian Orthodox Church, and traces of it are found in modern Egyptian Arabic. Hieroglyphic writing dates from c. 3000 BC, and is composed of hundreds of symbols. 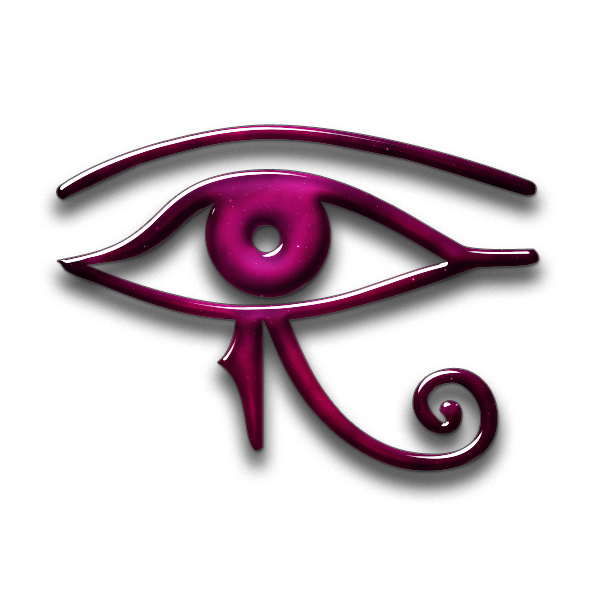 A hieroglyph can represent a word, a sound, or a silent determinative; and the same symbol can serve different purposes in different contexts. Hieroglyphs were a formal script, used on stone monuments and in tombs, that could be as detailed as individual works of art. In day-to-day writing, scribes used a cursive form of writing, called hieratic, which was quicker and easier. 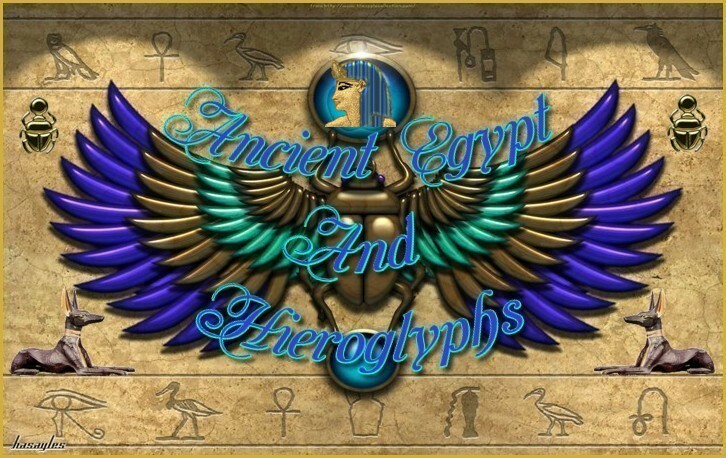 While formal hieroglyphs may be read in rows or columns in either direction (though typically written from right to left), hieratic was always written from rightto left, usually in horizontal rows. A new form of writing, Demotic, became the prevalent writing style, and it is this form of writing—along with formal hieroglyphs—that accompany the Greek text on the Rosetta Stone. Around the 1st century AD, the Coptic alphabet started to be used alongside the Demotic script. Coptic is a modified Greek alphabet with the addition of some Demotic signs. Although formal hieroglyphs were used in a ceremonial role until the 4th century, towards the end only a small handful of priests could still read them. As the traditional religious establishments were disbanded, knowledge of hieroglyphic writing was mostly lost. Attempts to decipher them date to the Byzantine and Islamic periods in Egypt, but only in 1822, after the discovery of the Rosetta stone and years of research by Thomas Young and Jean-François Champollion, were hieroglyphs almost fully deciphered. Writing first appeared in association with kingship on labels and tags for items found in royal tombs. 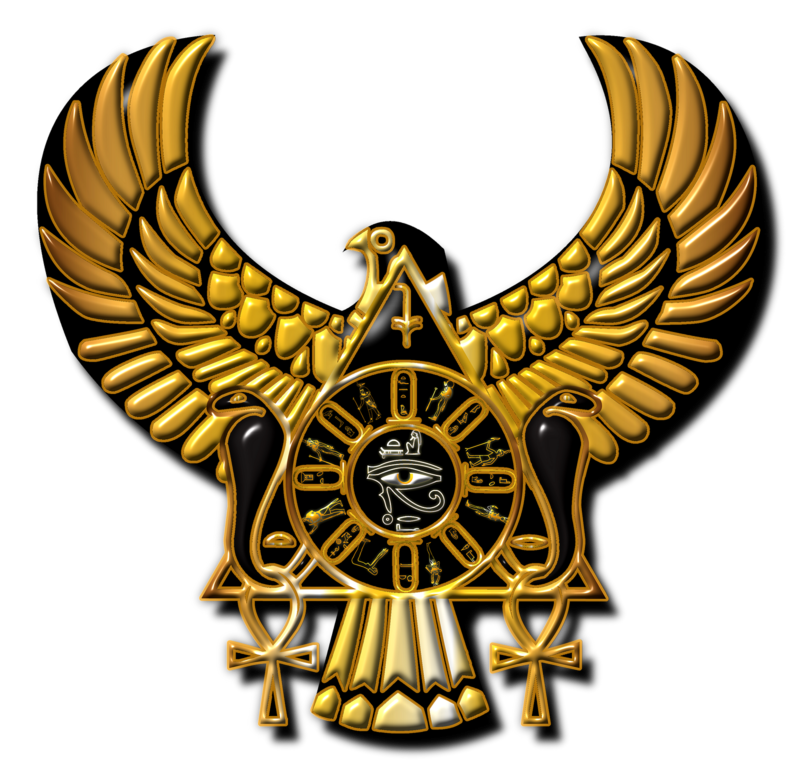 It was primarily an occupation of the scribes, who worked out of the Per Ankh institution or the House of Life. The latter comprised Offices, libraries (called House of Books), laboratories and observatories. Some of the best-known pieces of ancient Egyptian literature, such as the Pyramid and Coffin Texts, were written in Classical Egyptian, which continued to be the language of writing until about 1300 BC. Later Egyptian was spoken from the New Kingdom onward and is represented in Ramesside administrative documents, love poetry and tales, as well as in Demotic and Coptic texts. During this period, the tradition of writing had evolved into the tomb autobiography, such as those of Harkhuf and Weni. The genre known as Sebayt (Instructions) was developed to communicate teachings and guidance from famous nobles; the Ipuwer papyrus, a poem of lamentations describing natural disasters and social upheaval, is a famous example. 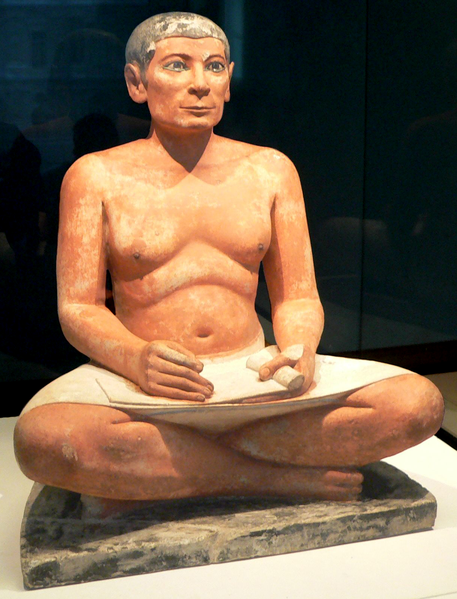 Instruction of Amenemope is considered a masterpiece of near-eastern literature. Towards the end of the New Kingdom, the vernacular language was more often employed to write popular pieces like the Story of Wenamun and the Instruction of Any. The former tells the story of a noble who is robbed on his way to buy cedar from Lebanon and of his struggle to return to Egypt. From about 700 BC, narrative stories and instructions, such as the popular Instructions of Onchsheshonqy, as well as personal and business documents were written in the demotic script and phase of Egyptian. 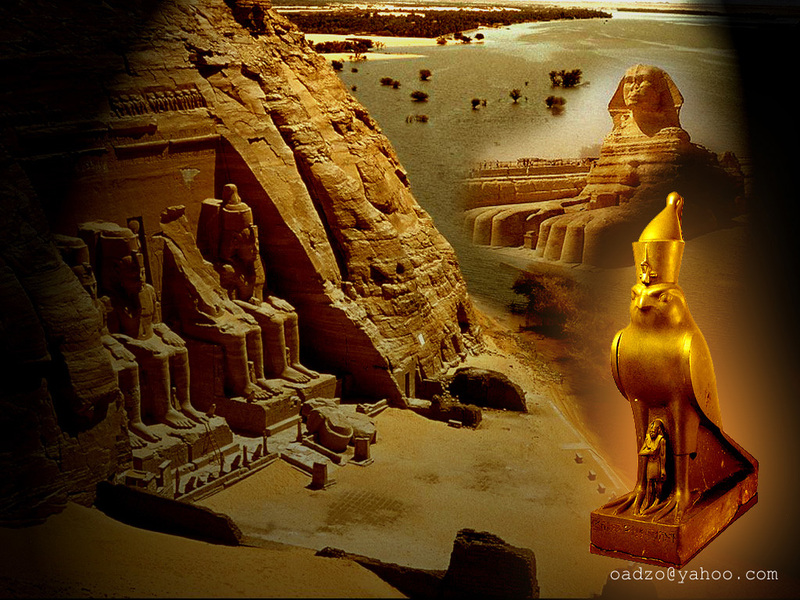 Many stories written in demotic during the Graeco-Roman period were set in previous historical eras, when Egypt was an independent nation ruled by great pharaohs such as Ramesses II. The texts were first discovered in 1881 by Gaston Maspero, and translations were made by Kurt Heinrich Sethe (in German), Louis Sleepers (in French), Raymond O.Faulkner, Samuel A. B. Mercer and James P. Allen (the latest translation in English). The oldest version consists of 228 spells and comes from the Pyramid of Unas, who was the last king of the 5th Dynasty. Other texts were discovered in the pyramids of the 6th Dynasty kings Pepi I, Pepi II and three of his queens, and Teti. Kurt Sethe's first edition of the pyramid texts contained 714 distinct spells; after this publication additional spells were discovered bringing the total to 759. No single collection uses all recorded spells. Oho! Oho! Rise up, O Teti! 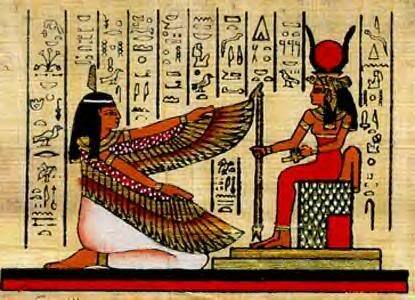 Takes you into heaven, to your father Geb. Rise up, O Teti, you shall not die! Open Unas's path, let Unas pass! Then he will ferry Unas to that side! Utterances 273 and 274 are sometimes known as the "cannibal hymn", because it describes the king hunting and eating parts of the gods: They represent a discrete episode (Utterances 273-274) in the anthology of ritual texts that make up the Pyramid Texts of the Old Kingdom period. Appearing first in the Pyramid of Unas at the end of the Fifth Dynasty, the Cannibal Hymn preserves an early royal butchery ritual in which the deceased king—assisted by the god Shezmu—slaughters, cooks and eats the gods as sacrificial bulls, thereby incorporating in himself their divine powers in order that he might negotiate his passage into the Afterlife and guarantee his transformation as a celestial divinity ruling in the heavens. The style and format of the Cannibal Hymn are characteristic of the oral-recitational poetry of pharaonic Egypt, marked by allusive metaphor and the exploitation of wordplay and homophony in its verbal recreation of a butchery ritual. Apart from the burial of Unas, only the Pyramid of Teti displays the Cannibal Hymn. The cannibal hymn later reappeared in the Coffin Texts as Spell 573. It was dropped by the time the Book of the Dead was being copied. In the first scene of Philip Glass's opera Akhnaten, the phrase "Open are the double doors of the horizon" is a quotation from the Pyramid Texts. More specifically, it seems to come from Utterance 220. The American death metal band Nile made a song, "Unas Slayer of the Gods" which contains many references to the Pyramid Texts, including the Cannibal Hymn. In the 2001 action-adventure movie, The Mummy Returns, when Imhotep gets a jar full of dust and blows it, he quotes part of the Utterance 373 and the dust turns into mummy warriors. Heute waren schon 24 Besucher (35 Hits) hier!